Alonso’s Jordan Butler celebrates with teammates after his tying HR in the sixth helped set the stage for a walk-off win in the seventh. The red-hot Alonso Ravens put themselves in excellent position to advance into the championship bracket of the 36th annual Tony Saladino Tournament on Monday afternoon. 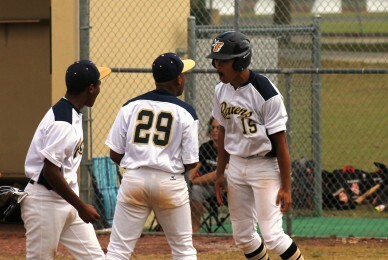 The Ravens’ late-game heroics led to a 4-3 walk-off victory over Robinson to improve to 2-0 in Pool A, at Sickles High. Alonso also won its tenth straight decision. Jordan Butler’s solo home run in the bottom of the sixth evened things up to keep the Ravens (10-3) alive. Alonso then worked its way out of a bases-loaded, no-outs jam in the top of the seventh to set the stage for the dramatic finish. Jonathan Cruz singled to start things off, Matt Steckel walked to move him into scoring position and Jose Ciccarello delivered the final blow with a liner past third base that pushed Cruz home to complete the comeback. A victory over Blake in Tuesday’s final action of Pool Play should be enough to push Alonso through to the winner’s bracket at Brandon High beginning on Wednesday. Strawberry Crest also remains in contention for a berth, after a 6-4 win over Sickles improved the Chargers to 2-0 in Pool B. Lennard won an exciting 9-7 battle with Blake and Hillsborough blanked Middleton 25-0 in the other action at Sickles High. Sickles and Hillsborough face off Tuesday night with major implications at stake in Pool B.
Brooks DeBartolo scored its second upset victory in Pool G to put itself in excellent position to also advance, edging Newsome 3-1. Luis Andajar, Logan Eade, and Jackson Alvord each had two hits for the Phoenix (5-7). Brooks DeBartolo squares off Tuesday against the Riverview Sharks, who also improved to 2-0 in the pool with a 2-1 win over Gaither. The Sharks (7-6) scored two runs in the bottom of the sixth to earn the win for Manny Martinez. Matthew Yates closed things out to earn the save. 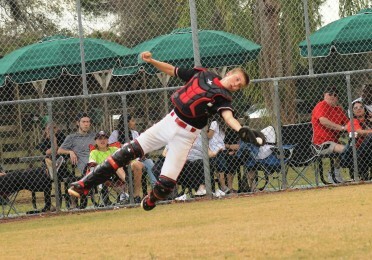 Hillsborough catcher Aaron Jensen makes an impressive catch on a high pop foul against Middleton. The Freedom Patriots earned a big 9-6 win over Plant City in Pool E to improve to 2-0, setting up a big meeting with Bloomingdale on Tuesday afternoon at Brandon. The Bulls improved to 1-1 in the pool with a 10-3 victory over Chamberlain on Tuesday. The Raiders also remain alive in the mix with a 1-1 mark, needing a big win over Chamberlain to keep their hopes alive. Steinbrenner is in the driver’s seat in Pool C following a 10-0 win over Armwood that put it at 2-0 with a meeting against Wharton coming Tuesday to decide things. The Wildcats downed Durant 6-1 to even their record to 1-1, and Armwood still has some chance but will need help should it defeat Durant in its pool-play finale. The East Bay Indians also find themselves in prime position after edging Brandon 8-6 in Pool F. East Bay is 2-0 and needs a win over Leto to win that pool. A comeback 5-3 victory over Jefferson kept the King Lions streaking to their seventh straight win and a 2-0 mark in Pool D. The host Dragons battled for a 3-2 lead in the fourth before King answered back with three runs that decided things. King (11-2) squares off against Plant on Tuesday afternoon to decide the pool winner, as the Panthers also hold a 2-0 mark following a 7-0 shutout over Tampa Bay Tech on Monday.